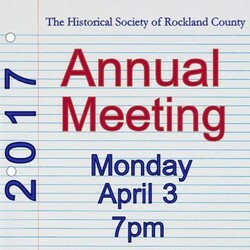 Friendly Reminder: The Annual Meeting of the Historical Society of Rockland County will take place tonight! The Annual Meeting of the Historical Society of Rockland County will be held on Monday, April 3, 2017, at the HSRC's History Center, 20 Zukor Road, New City, New York, 7:00 pm. The order of business will include reports of the committees and elections of Trustees. All members of the public are invited.